Donald Trump is a gift to political cartoonists and satirists in general. His policy positions are extreme, though some are extreme left while others are extreme right. His public statements are the definition of “gaffe.” It would seem Trump is a godsend for political cartoonists. While that may have been true during the beginning of the election cycle, that may no longer be the case. How many times can a satirist lampoon, once again, Trump’s misogynistic rantings? How many different ways can a satirist expand on Trump’s xenophobia? How many times of pointing out Trump’s misuse of statistics to the point of outright lies finally becomes tiresome? Because of these limitations, cartoonists ignore his missteps and look for other issues on which to direct their invective, and other ways to caricature Trump. With few exceptions, satirists do not want to get the reputation of repeating themselves to the extent that readers expect a “Trumpism du jour.” That gets as tiresome as the candidate himself. Cartoonists attempt to push beyond the cliché. In fact, after one of the most catastrophic events in American history, the attack on the World Trade Center, Ann Telnaes excoriated her peers for being overly and overtly patriotic, “We shouldn’t be flag-wavers. You can do that on your personal time. — I flew a flag — but not in your cartoons. We’re supposed to be a voice of other possibilities.”[i] That principle is not only applicable after tragedies, but it applies to overused punch lines in cartoons as well. Therefore, even those satirists who are most adamantly opposed to the possible election of Donald Trump must reach beyond Trump’s daily inappropriateness to the reality of Trump’s attractiveness to a large portion of the electorate and examine why that is happening. That gives rise to a class of cartoons that portray Trump in a positive light. True to the vast majority of American cartoons, however, is that if Trump is depicted positively, something or someone else is the foil. This analysis comes with a disclaimer that since the subject is pictorial humor, there may be some difference of opinion among readers as to whether the artist’s primary target was Trump or the alleged foil. These cartoons were chosen because the author’s first impression was that Trump was not the primary target of the humor. With that in mind and the distinct possibility that there will be differing opinions, here are cartoons that contain Trump, but make Bernie Sanders the foil. Published on May 19, 2016, Robert Ariail depicts a boxing match between Trump and the Republican Party symbolized by the elephant. The fight is disrupted by a riot between various Democrats, symbolized by the donkeys at ringside. While there is one donkey with a Hillary sign, the most vicious of the asses are depicted as Sanders partisans. The reason why this is pro-Trump is that despite the “Stop Trump” movement and various powerful Republicans (including the entire Bush family) refusing to endorse Trump, the Democrats are depicted as more combative than the Republicans. Robert Ariail, 19 May 2016. Jack Ohman depicts Bernie Sanders handing the presidency to Donald Trump on a silver platter. This cartoon, published on May 20, 2016, also depicts Hillary Clinton at a nearby table with a goblet in front of her and shrouded in gossamer. Despite Trump’s beatific yet condescending expression, the cartoonist is decrying Sander’s poor judgment in harshly criticizing Clinton for her vote to invade Iraq and pandering to Wall Street types. The artist suggests that Sanders is handing the presidency to Trump, a person within the wealthy class that Sanders had been stridently campaigning against. Jack Ohman, 20 May 2016. The following cartoon is a direct comparison between the careless statements of Donald Trump toward various immigrants and the carelessness of Clinton in her handling of State Department emails. While Bernie Sanders may have been sick of hearing about those “damned emails,” Republicans can’t hear about them enough. On June 23, 2016, Lisa Benson filled that void by comparing Clinton’s criticisms of Donald Trump to her own mistakes of using a personal computer to email classified information. In the background, is that the silhouette of a foreign spy who is reading the contents of Clinton’s brief case? Maybe it is an FBI detective who will later regard her handling of the emails as “extremely careless” but not criminal. Lisa Benson, 23 June 2016. Finally, the most common foil for the positive Trump cartoons are the ones that depict the Republican Party in disarray following the successful campaign by Trump to win more primary delegates than any of the Republican candidates for President in the 2016 race. In those cases, the whole of the GOP is depicted as an elephant. And, true to the nature of political cartooning, the beast is put into the most precarious of situations. International cartoonists also get into the act of satirizing American politics. After all, if the winner of the U.S. presidency is considered the “leader of the free world,” American politics is fair game overseas. Heng Kim Song of the Straits Times (Singapore) depicts Donald Trump dragging a reluctant bride to the marriage altar. The reluctant bride’s fingernails are gouging the carpet to the amazement of spectators. Contrary to physics and American satire, however, the dress is still maintaining the dignity of the bride. This illustrates the uncomfortable position that the Republicans find themselves after having allowed a radical to infiltrate their party and win. Clearly, in this depiction and in electoral politics, Trump has defeated the stalwarts of the GOP. Heng Kim Song, 30 May 2016. One of the oldest and clearest depictions of a political election is as a race. It is easy to depict and there is little confusion that when one candidate crosses the finish line and the others have not, a winner can be declared. The race as a metaphor can also obscure clarity of a contest. Take the following cartoon of May 31, 2016 by Clay Bennett as an example. 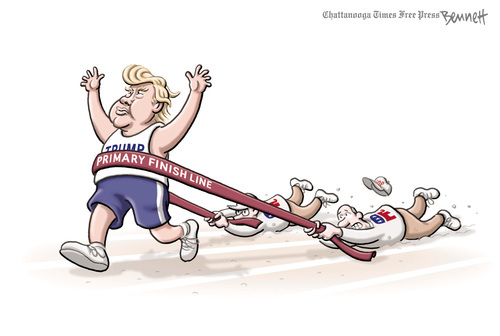 Donald Trump is depicted crossing the finish line. The cartoonist depicts the tape not having been broken and the two GOP members who were holding the tape refuse to let go. Has Trump won the race or not? We will find out at the convention. Clay Bennett, 31 May 2016. In political cartoon culture, cartoonists are given one opportunity to state the obvious on an issue. After that, they are challenged to look beyond the obvious and examine underlying realities. Cartoonists are expected to push the boundaries of convention and cause the public to consider ideas that are neither readily apparent nor popular. Ranan Lurie called the editorial cartoon “the most extreme form of expression that a society will accept or tolerate.”[ii] In this case, readers are asked to consider that there are some entities worse than Donald Trump. I will leave readers to mull that one over. [i] Dave Astor, “Editorial Cartooning Post 9-11,” Editor and Publisher 4 February 2002. Internet: http://www.editorandpublisher.com/news/editorial-cartooning-post-9-11/. [ii] Chris Lamb, Drawn to Extremes: The Use and Abuse of Editorial Cartoons, New York, Columbia University Press, 2004. 22.